I took the photo shown above in dim early morning light on February 21, 2015. Keyhole limpet shells on the beach is not an unusual thing. Rough keyhole limpets, Diodora aspera, (along with whitecaps, Acmaea mitra) are the most common intact limpet shells found on the surf-swept sandy beaches of northern Oregon. There are plenty of other limpets, some quite abundant, living on adjacent rocky shores, but it’s rough keyholes and whitecaps that appear most often on the beaches. In life, rough keyholes occur mainly in the lower rocky intertidal where they are exposed only during the lowest tides. I know rough keyholes best from their empty shells on the beach, which I find kind of intriguing, but I’d like to change that by getting to know them on their home turf, in the rocky intertidal. I’m waiting patiently for the next low tide sequences during daylight hours, when I should have my long-awaited encounter with live rough keyholes. It’s been a long wait; so long that, a few days ago, I found myself absent-mindedly doodling one from memory, on my phone’s sketchpad. 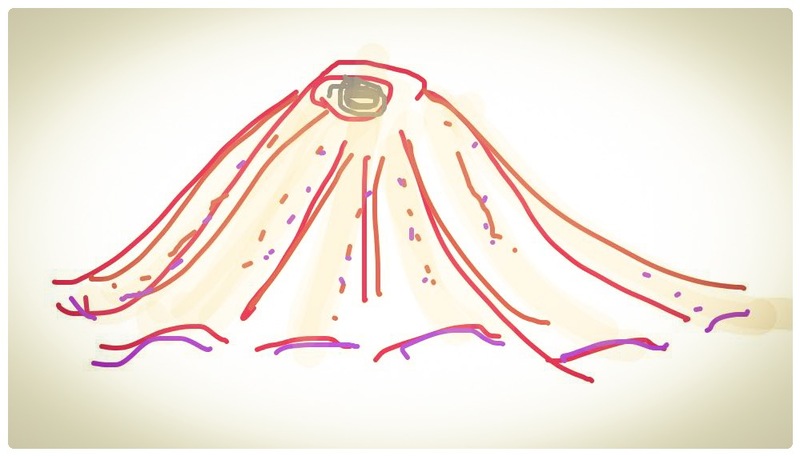 It’s a pretty bad rendition – the posterior slope of the shell of real rough keyholes is not concave, and the apex is a bit farther anterior of center than in my sketch – but I took my doodling as a sign that it’s time to tell my keyhole limpet story. Here’s what the shells look look like when you find them on the beach. Note the oval shape of the base of the shell, and purplish-brown rays; the field guides say the perforation at the apex is oval to nearly round. The shell in the top image has remnants of an encrusting organism, maybe a bryozoan, on the posterior surface. Some of the field guides say the shells, washed up on the beaches, are a prize for shell collectors. Sure enough, click here to see an article about making ornaments from rough keyhole shells. I tried it and it and got a nice result! I had a chance, a few weeks ago, to briefly visit the famous tide pools at Point Pinos, on the central California coast. Low tide wasn’t very low, but it was an opportunity to connect with my Ricketts and Calvin roots (for some of that story, go to Coming Full Circle with Hermissenda crassicornis). The tide pools at Point Pinos and Point Lobos are among the best in the world, and even on a high low tide, it’s not unreasonable to have expectations. Almost immediately I thought I’d found what I was looking for. Notice, however, in the photo above, the conical shape of the shell, the ashy pink coloration, and narrow oval perforation (about three times as long as wide). That’s right – Fissurella, the volcano limpet. You won’t find them in northern Oregon, but in the rocky intertidal of central California they can be common, and they tend to range a bit higher in the intertidal than rough keyholes, which explains why I was able to find this one on a high low tide. As you will have noticed, distinguishing the rough keyhole and volcano limpets involves examining the shape of the apical perforation. 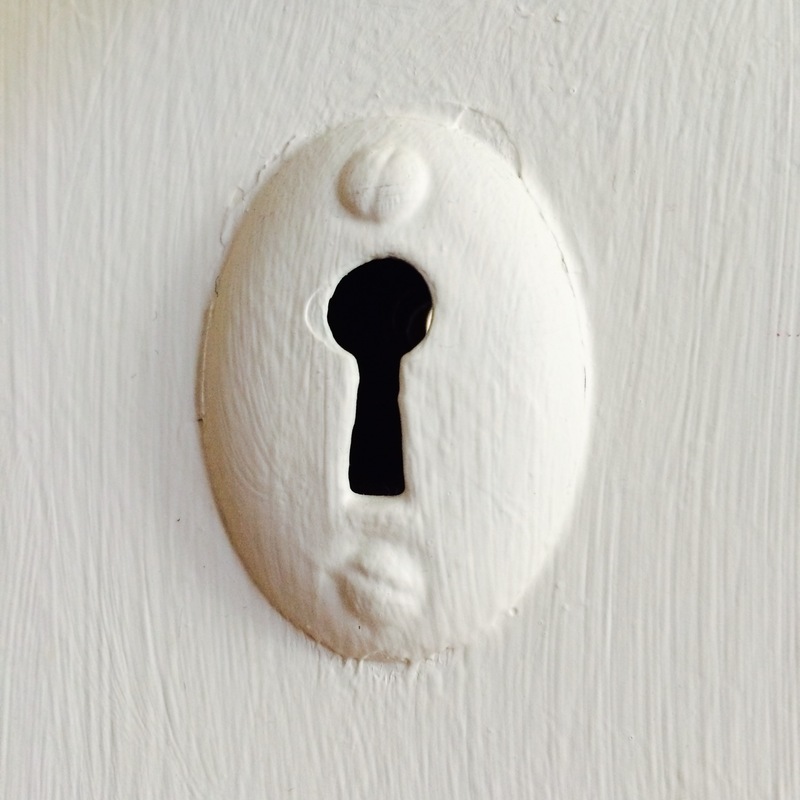 Does the perforation of the rough keyhole really look like a keyhole? I expect the perforation to pretty much resemble a keyhole. The photo above is a good example; I took it just a few feet from where I’m writing this – I don’t have to google images of keyholes. Or do I? I wonder what Jens Rathke’s thoughts about the keyhole were, in Oslo, back in 1833, when he first applied the name Diodora aspera. 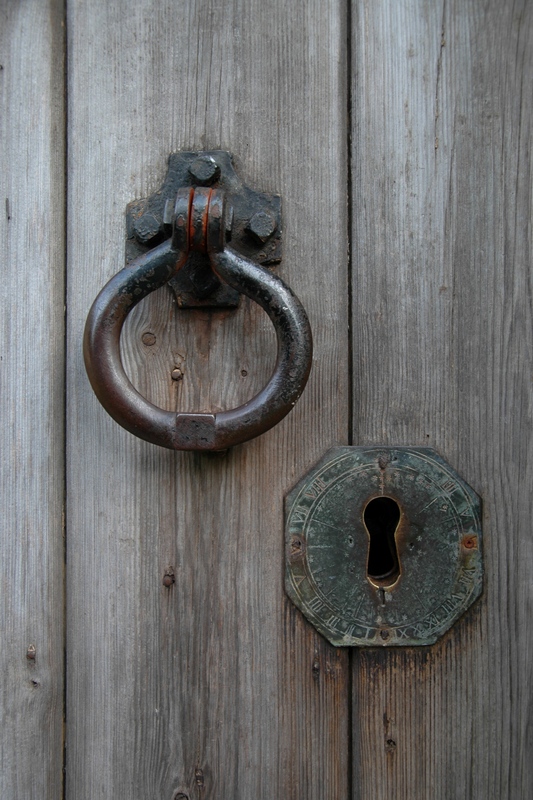 The image above lets the cat out of the bag – I did end up Googling images of old-time keyholes, and it looks like keyhole shape, until recently, has been consistent over time; what we might call conserved. Form follows function, they say. I wonder what the function of the keyhole in keyhole limpets is. Turns out the explanation has been kind of elusive. Maybe the perforation is a mere quirk of history, a shell perforation belying past connections to the abalones. (M. Sars letter, qtd. in Økland 1955) – From, The Copepodologists Cabinet: A Biographical and Bibliographical History, Part 1, by David M. Damkaer. Pages 110-112 of Damkaer’s book give an interesting account of Rathke, one that at least partially explains why Rathke had so little left to give new students, like Sars, however promising they may have been. The best view of the keyhole is the interior view. Here’s the interior view of the D. aspera keyhole. It’s just like the field guides say, the posterior of the perforation slightly excavated. You can judge for yourself how keyhole-like the perforation is. Fissurella fascicularis (wobbly keyhole limpet) (San Salvador Island, Bahamas) 2, by James St. John, Creative Commons Attribution 2.0 Generic license. Is the perforation of the wobbly keyhole limpet, Fissurella fascicularis , a bit more keyhole-like? 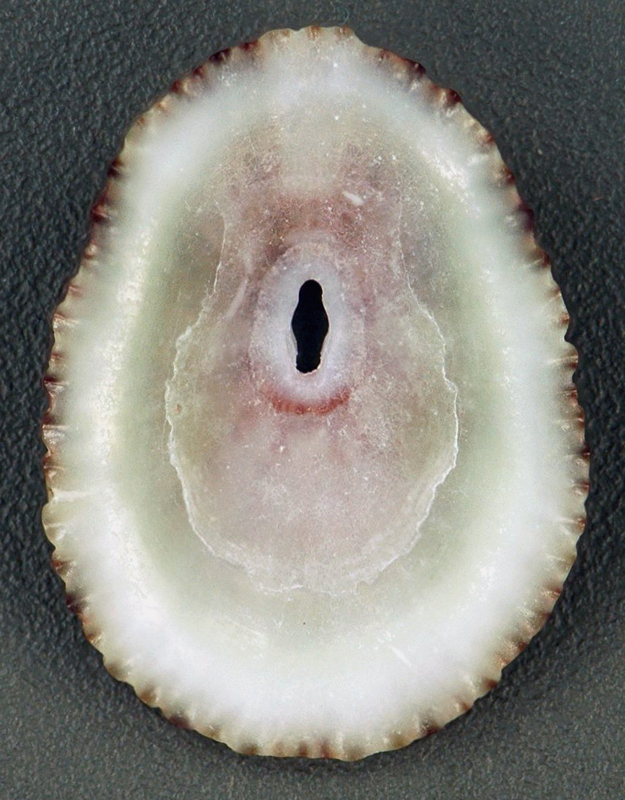 World-wide, there are lots of keyhole limpets and the perforation of some look more like a keyhole than others. What do you think about Diodora italica? I opened this story with a photo of a D. aspera shell from February 21, 2015. If you want to see some other things I found on the beach that morning, click on Wrack Line 2015. Thank you for the scientific name. I find at least three species on my north Oregon shore but did not know any of their names. Thanks for your comment. Keyhole limpets hold up pretty well on the beach and are easy to identify (thanks to the keyhole!). As you say, there are others. You’ve given me the idea to feature some other limpets in the weeks to come. Maybe you’ll see yours. Hi Rich, Thanks for dropping me a line. Your question is an interesting one. I hadn’t thought about it until I got your note. I find empty keyholes on the sandy beaches. They are usually small. I absent-mindedly pick some up, so I just took a minute to measure the ones I had on hand, my most recent: 1-3/4″, 1-1/2″, 1-1/2′, 1-3/8″, 1-1/4″, 1-1/8″, 1″. The live ones on the rocks, at the ones I notice, seem a bit larger. With Pisaster taking a hit over the last few years, I thought maybe the keyholes might benefit, but I’m not aware of any trend in that direction, or the trends you mention. But now I’ll keep it in mind. Very interesting observations. Thank you! Hi Rich, I checked out Maverick’s on google earth. Nice reef! I’m not sure I have a great recommendation for you. I don’t run across a lot of live ones. I’m usually not looking specifically. But I’ve probably seen more on the rocks at Indian Beach at Ecola State Park than most other places. I’ve picked up the odd empty shell on most all the sandy northern Oregon beaches. If I talk to anyone who know a better spot for keyholes, I’ll drop you a line. Hi Rich, Thanks for the tip and some of your history. I wanted to tell you since we first talked, I was able to look at some keyhole limpet shells I collected a bit farther back than the ones I measured for you. They were indeed larger. Of course, I was probably just picking up the bigger shell, so still no answer to your original size question.